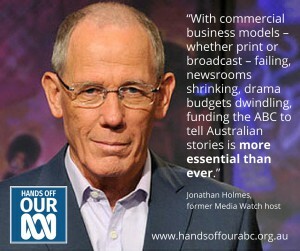 Jonathan Holmes, former host of Media Watch. The ABC has never been under greater attack in its long and storied history than it is now. Almost $340 million has been cut from its base funding since 2014. Programs have been axed, locally produced drama is way down, foreign bureaux have been closed and hundreds of years of journalistic experience has been lost. 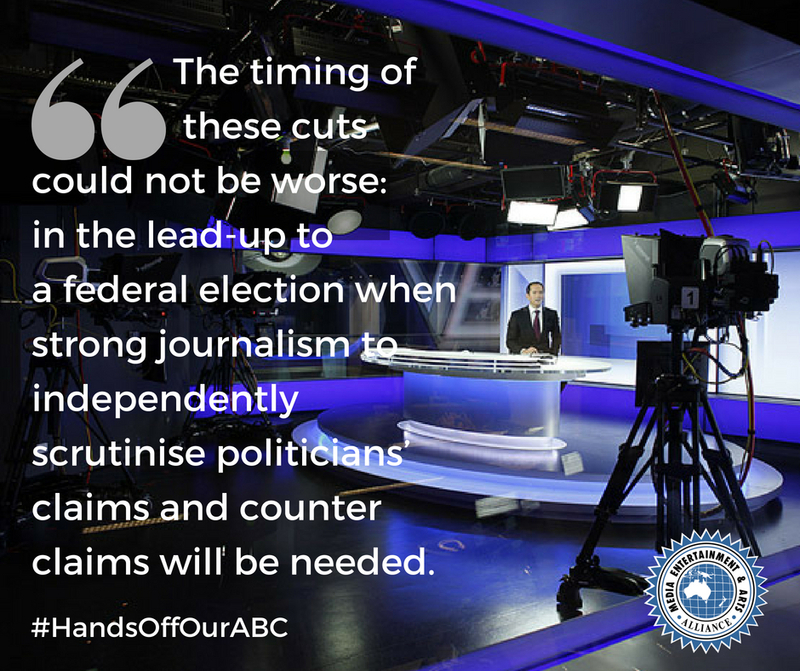 ABC journalists simply doing their job are attacked on an almost daily basis by Coalition politicians. 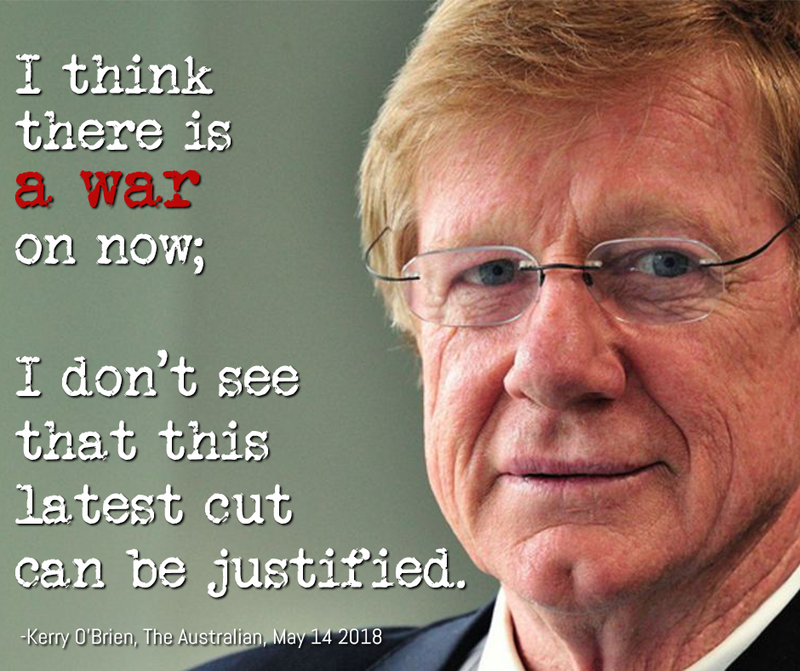 Attacks on the ABC are nothing new, but Quentin Dempster says the current hostility is “the worst we’ve seen”. 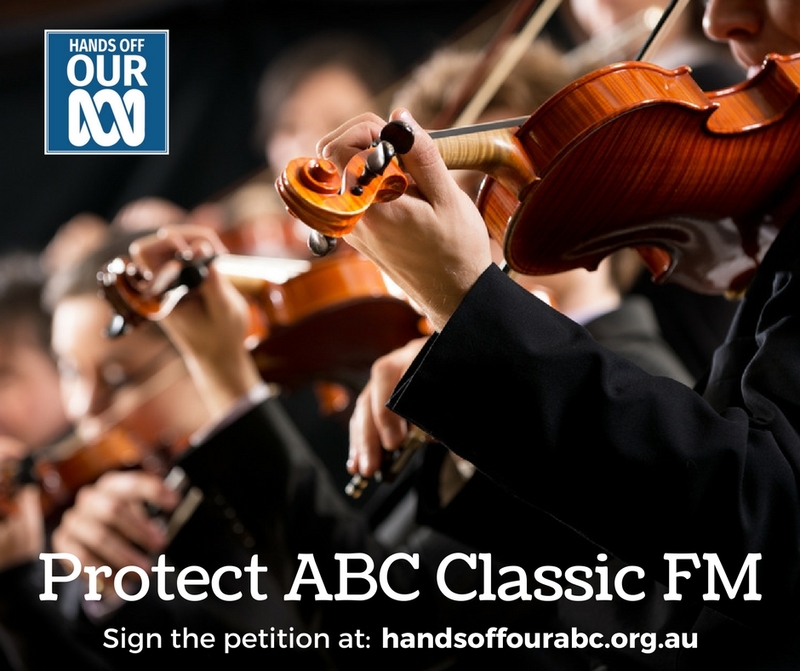 On top of funding cuts, “fair and balanced” legislation, a steady stream of politically-motivated complaints and inquiries, we now have the Liberal Party federal council voting 4:1 in favour of selling off the ABC. 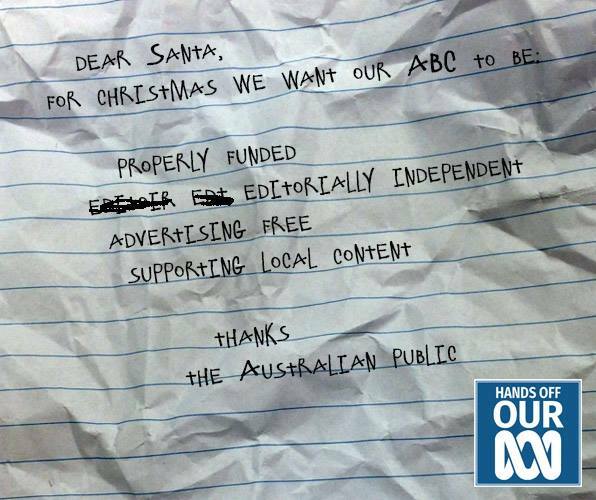 But the ABC isn’t theirs to sell. It belongs to us, the Australian public, and it’s time to start fighting back. 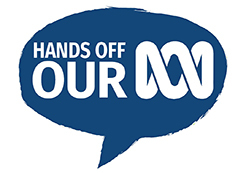 Hands Off Our ABC is a community and advocacy campaign co-ordinated by the two unions that represent the vast bulk of employees at the ABC: the Media, Entertainment & Arts Alliance and the Community and Public Sector Union. 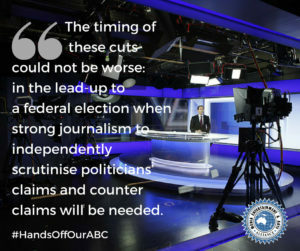 Our goal is an editorially-independent ABC that is fully-funded by the government and meets its charter as a comprehensive national broadcaster, that is resourced to tell Australian stories across multiple platforms, and positioned to take advantage of new technology to retain its position as the most trusted and reliable source of news and entertainment in Australia. 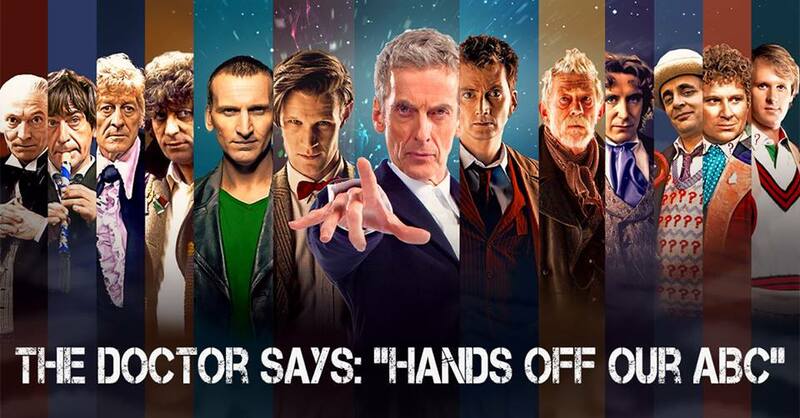 Keep up to date by liking the Facebook page. 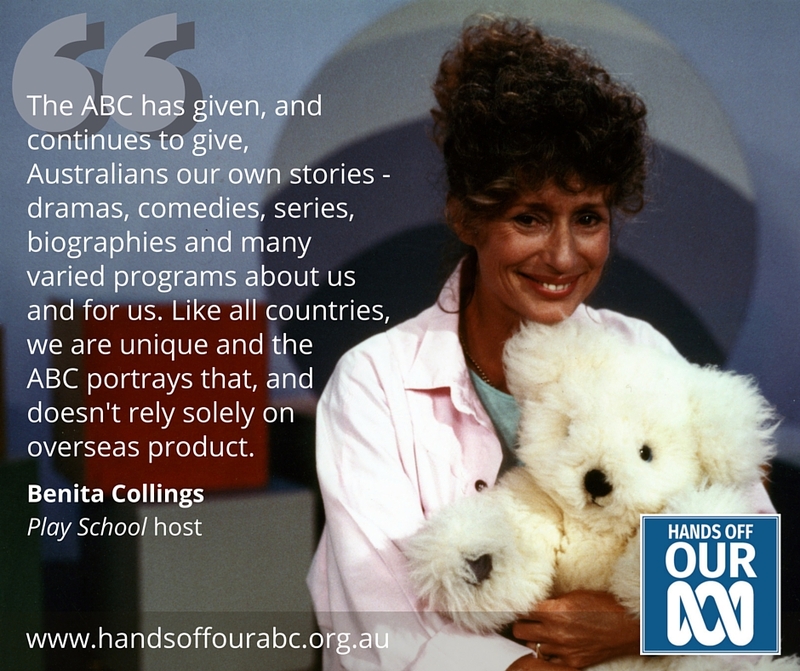 For more than 80 years, the ABC has touched the lives of all Australians in one way or another. Whether it is watching Play School as a child, debating Triple J’s Hottest 100 with friends, tuning into our favourite radio programs or keeping up-to-date with the latest news and current affairs, the ABC plays a pivotal role in informing and shaping our views about Australian life and contributing to our sense of nation identity. 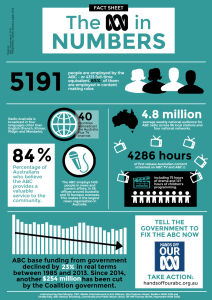 Yet for too long the ABC has been taken for granted, receiving less and less funding from government while providing more services than ever before as new technology has evolved. Today, the ABC delivers content across four television channels, online, to your mobile device or digital radio. 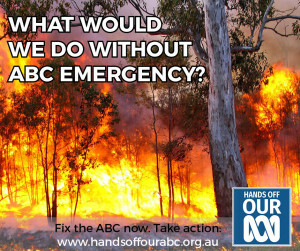 The ABC keeps communities informed in a crisis, through our vital national emergency broadcast service. We take for granted that the ABC delivers its suite of services to us wherever we are, whenever we need it. 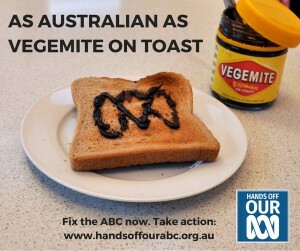 When the ABC is required to do so much more with less, it’s inevitable the cracks start to show. We all love the ABC. We are proud of what the ABC represents in Australian lives. But the rate of technological progress has far outstripped the funding made available by successive federal governments. 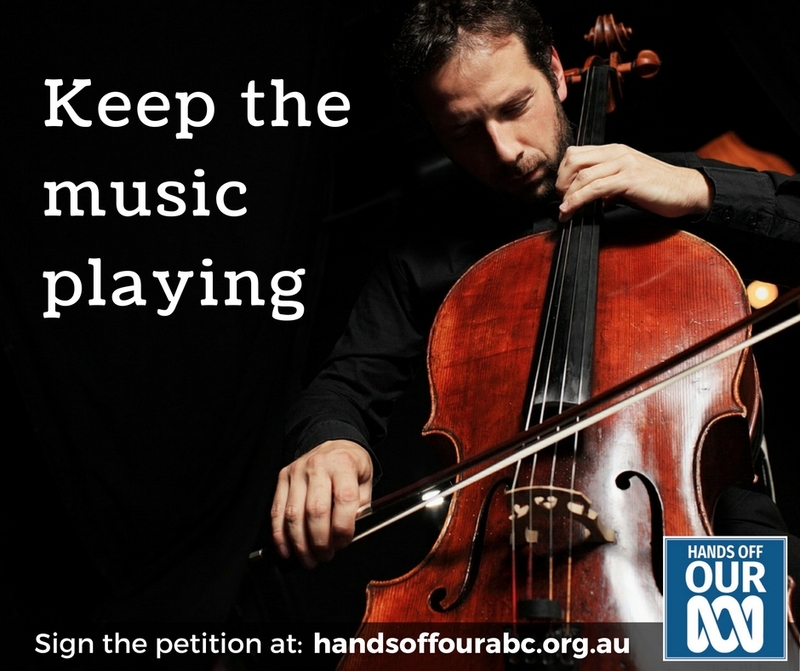 That means it’s getting progressively harder to maintain a strong ABC now and for the next generation of Australians. 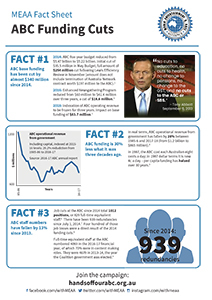 The ABC’s “make-do” solutions to the chronic massive underfunding crisis are unsustainable. 1. 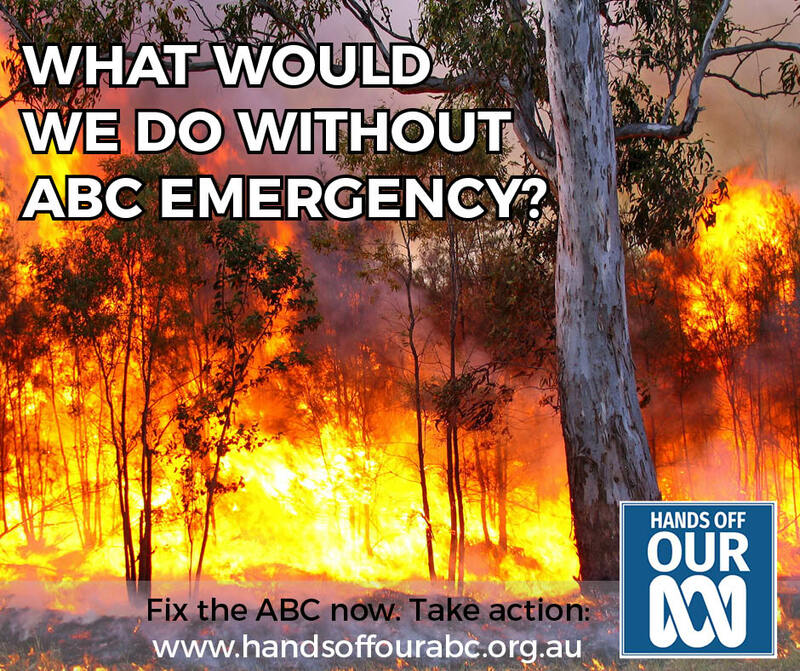 Restore ABC funding to a sustainable level over the next two ABC triennial funding agreements. 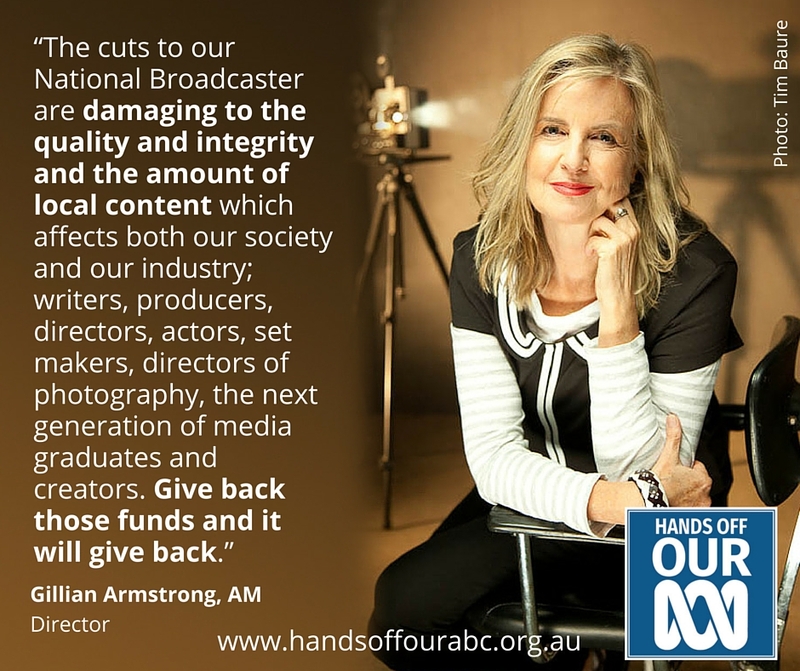 The ABC cannot continue to provide Australians with the level of innovative and comprehensive broadcasting services required under the ABC Charter without the significant restoration of the $254 million in funding and 400 jobs which have been stripped from the organisation. 2. 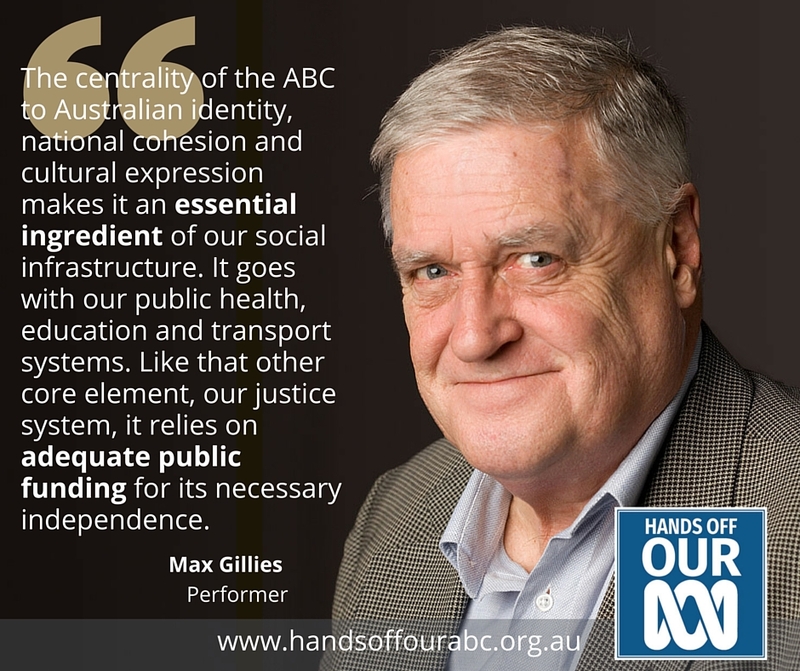 Respect the editorial and programming independence of the ABC as enshrined in the ABC Act. 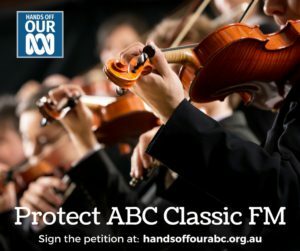 Governmental interference in the ABC undermines the integrity of its news coverage and it must always be independent of any political influence. 3. 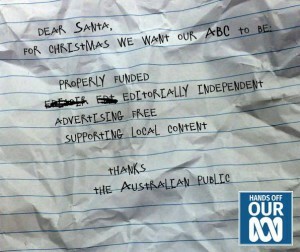 Keep the ABC 100% commercial-free. The vast majority of Australians do not want commercial advertising disrupting their ABC programs and services or on ABC websites. Further the ABC’s position as our most trusted source of News relies on the ABC being free of commercial influence. 4. Curtail outsourcing and do not seek to privatise or commercialise any parts of the ABC. Since its inception in 1932, the ABC has been one of Australia’s most loved public institutions. 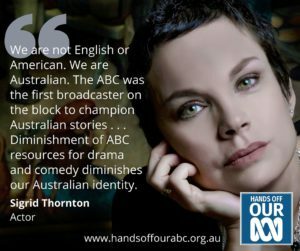 New technology and anticipated changes to media ownership mean that now more than ever, Australians are reliant on the ABC to tell their stories. The ABC must retain control of its functions including its internal production, if the ABC is to fulfil its Charter obligation and represent and reflect regional diversity. 5. 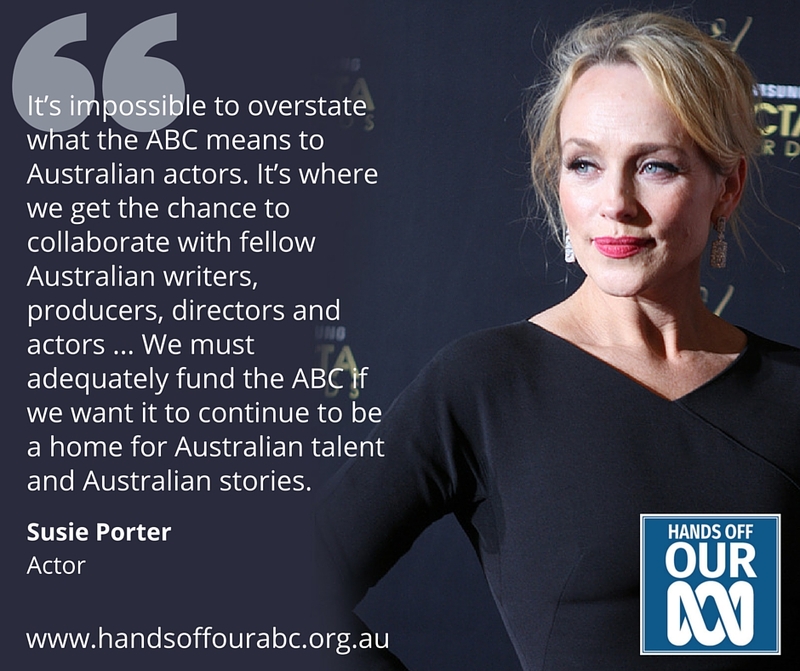 Foster and retain a diverse, skilled workforce that can create and deliver exciting Australian content. 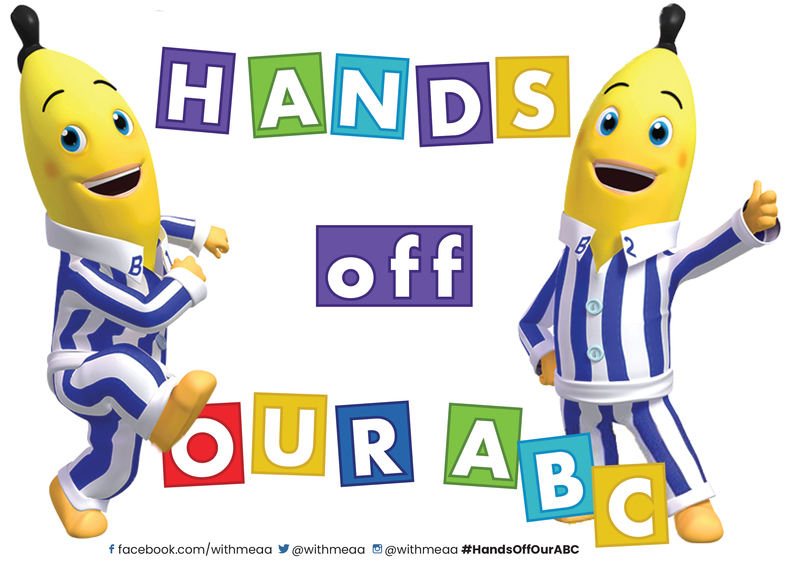 Increased casualisation and centralisation of ABC jobs in Sydney and Melbourne are deskilling and demoralising the ABC workforce. 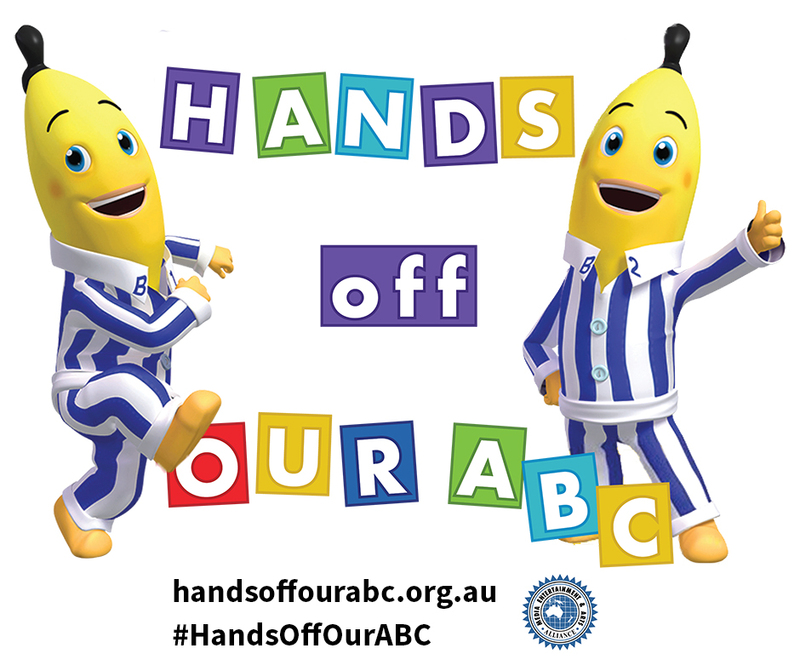 As a publicly-owned institution and model employer, the ABC has a responsibility to provide secure jobs, whole of industry training and model working conditions.